Having a well-manicured lawn and lush landscaping does more than boost your home's curb appeal. Having a healthy, thriving yard gives you and your family a beautiful outdoor space to enjoy, and even has a positive impact on the environment. While a home improvement project like installing new kitchen cabinets is a one-time job, your lawn requires constant and regular upkeep. With consistent attention and proper care, you'll have the greenest lawn in the neighborhood. Before you turn on the lawn mower and get to work, it's always best to plan out what needs to be done to your yard, and when you are going to tackle it. Whether your goal is to clear our the overgrown brush next to your garage, or do an overhaul of your landscaping, have an end goal in mind before you begin. Plan out your target areas. Gather all the tools and supplies you will need. Budget for new plants and landscaping material. Once you have made your plan, it's time to get your hands dirty. Clear your hard of any leftover leaves, branches, dead plants and weeds to make room for new plants and fresh growth. You may also want to clear your yard of old mulch that has lost its vibrant color to make room for a new layer once you've planted new plants. Clearing Tools - This will be for sawing branches, cutting down vines and taking care of pesky tree roots that are overgrown. Shrub Rake - For difficult to reach areas that are cluttered with dead plants and leaves, this will help you remove them. Weed Removal Tools & Spray - Banish dandelions, clover, thistles and other weeds from your land and landscape for good. Carefully remove large weeds (with the roots intact) and use the spray to make sure they don't resurface in a few months. To get rid of debris from a large-scale cleanup, you might consider renting a dumpster as a simple and convenient solution to yard waste. Also, keep in mind that instead of pitching some of the organic material that you've collected, you can compost the debris from your lawn. Add leaves, cuttings and mulch to the pile, just be sure to chip branches into smaller pieces first. There are plenty of pests that can damage your lawn and wreak havoc on your landscaping. Whether you have grubs in your grass, or moles that are digging tunnels through your landscaping, you'll want to take care of them in an environmentally friendly, and sustainable way. "If people have continual pest problems like grubs, the best defense is a soil test to learn about which nutrients will benefit their lawn most. Everyone has different soil conditions which will impact how well their grass grows. Usually, with pest problems, something is going on at the soil level." Give your lawn and plants a trip, which will not only cut off dead branches but promote new and healthy growth in the spring. Prune away any dead and damaged branches from trees and shrubs, and cut back any perennial plants or grasses in your yard so they can grow in spring and summer. Lawn Mower - Obvious, but you'll want to cut your grass after it's clear of all the debris. Hedge Clippers - For current landscaping that you aren't removing, make sure it's in top shape. Your yard cleanup isn't done just yet. 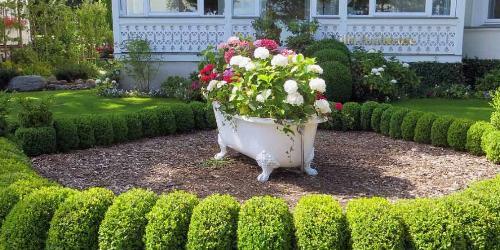 After you've removed any trash and dead plants from your landscaping, plant something new to bring new life to your yard - literally. Shovel - Not just for digging a spot to plant your new Hydrangeas, but it's helpful to break up and loosen the soil around the plants to allow for better root growth. Cultivator - Loosens up top soil, and is helpful for removing weeds and aerating. Trowel - Use this for digging small areas and turning earth. Ideal if you want to plant individual Petunias to line the walkway to your front door. Adding a fresh coat of mulch after scraping away the old layer, is just as important as adding in new gravel between the flagstones lining your patio. Pay attention to the permanent landscaping features in your lawn as well. If you have a paver patio or stamped concrete, use a power washer to remove any stains. For a deck or gazebo, sweep and wash it similar to a patio, but be sure to stain and seal any surfaces that are showing wear and tear. Paint, patch and replace worn out wood if you have small fencing around your garden, or an entire fence encasing your yard. After the debris is gone and new plants are in place, finish your yard cleanup with details that will make all the difference. New mulch, stones and decorative lights will help polish off your cleanup efforts. With any cleanup, the goal is to keep it that way in order to enjoy it throughout summer, and the only way to do that is with ongoing maintenance. 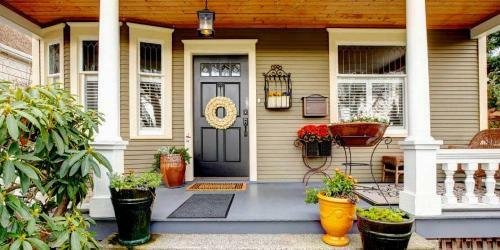 Painting your front door is an easy DIY project that can quickly boost your curb appeal. Before you pick up the paint brush, follow our step-by-step front door painting tips with expert advice from BEHR and Kelly-Moore.